Adventures in Stitching: Zen, doodling. I picked up Totally Tangled by Sandy Steen Bartholomew a week or so ago. I'm not much good at drawing, though I do a mean doodle, and I'm not afraid to sketch out an embroidery design idea...I think I'm better with thread than I am with a pencil. 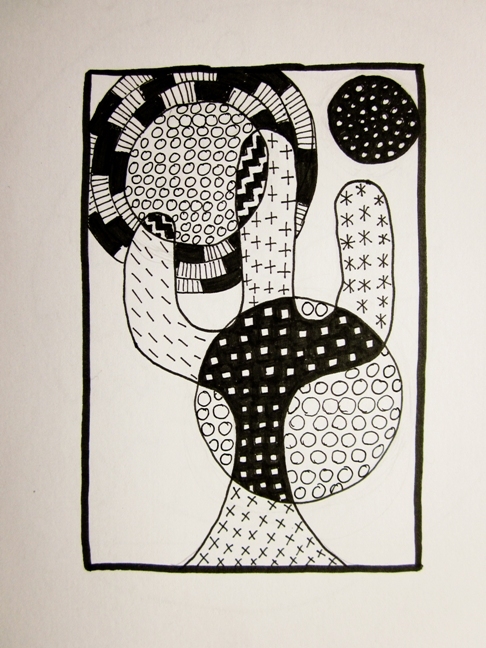 But, the book was inexpensive and "Zentangles" look like fun. "Zentangle" is a method of drawing and making images out of repetitive patterns. Sort of an organized doodle, you can see some wonderful examples at the official Zentangle website, and elsewhere on the web with a quick Google search. I'm very attracted to the look of Zentagles, and their intricate-looking detail. They very much look like the way I approach some freestyle embroidery, and could be a fun way to try out ideas. Despite the intricate look to a finished tangle, they are surprisingly easy. That up there, is one of my first "Zentangles"...I'm pleased, and a bit surprised, with how well it turned out! 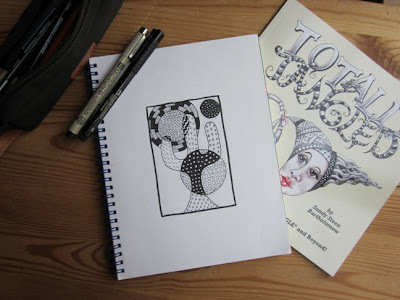 There is a book out about Zentangle fabric art called Zentangle: Fabric Arts - Quilting - Embroidery , by another author, I will probably get it before too long and will let you all know how it turns out!